Its 1957, America is obsessed with all things ‘Space Age’ and this Sylvania 4P14 fits right in! 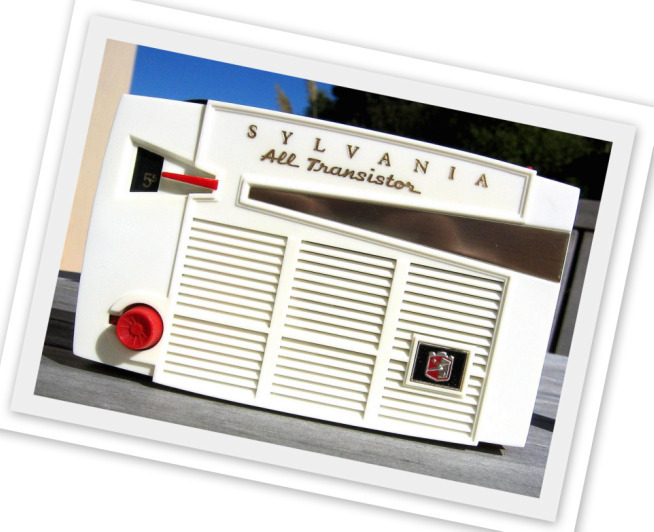 Sylvania made some really quirky looking radios and this is certainly one of them. I would categorize it as ‘transistorized oddball meets classic B grade kitsch’. Whatever, it’s got heaps of charisma and originality. It was even made in the good ole US of A! Just look at those crazy lines. 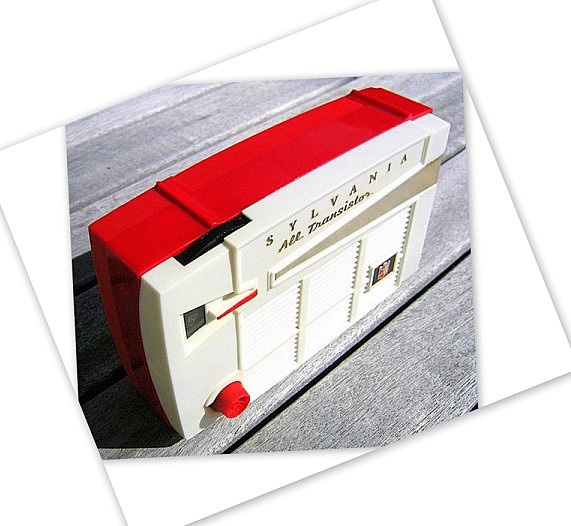 If you get tired of listening to this Sylvania the right way up then flip it upside down - it has feet on top as well. Sylvania made a vertical version of this radio, the 7P12. 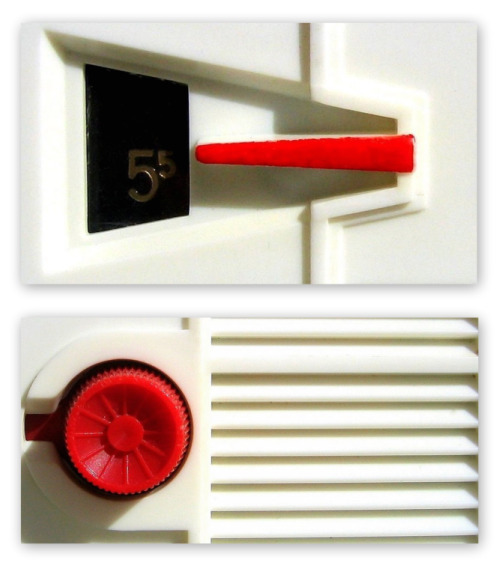 It uses the same cabinet as the 4P14. It looks almost identical if you stand it on its edge and with ‘feet’ running down both sides it gives the cabinet a balanced look. Sylvania made a habit of manufacturing radio cabinets that could be used for multiple purposes. Author and collector Eric Wrobbel states that Sylvania’s famous Thunderbird radio cabinet was also used for a television UHF converter and also as an intercom housing. Sylvania can trace its history back to 1901 when it specialized in the refurbishing of light bulbs. 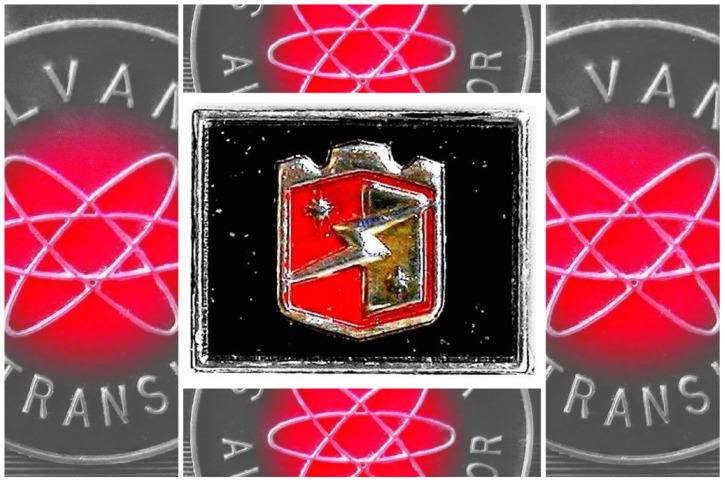 In 1942 the company was renamed Sylvania Electric Products. From 1951 until 1956, Sylvania were sponsors of the game show 'Beat The Clock'. The grand prizes on the show were Sylvania television sets, and some consolation prizes would be Sylvania radios. 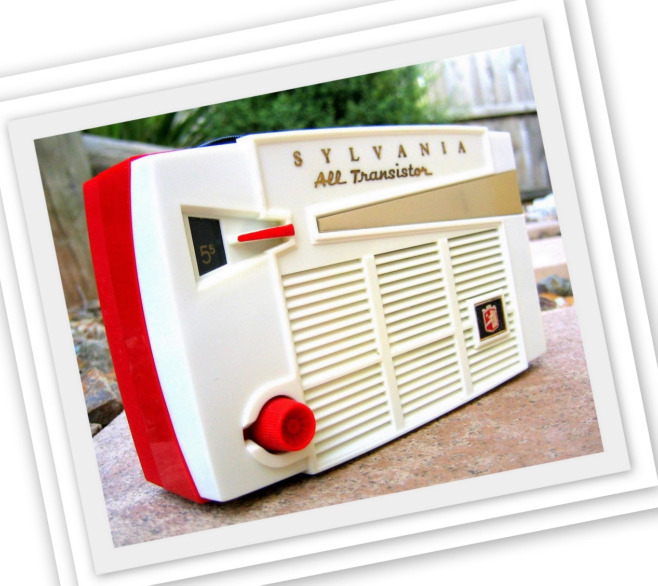 Sylvania also had radios manufactured in Japan and sold them under the brand name 'Golden Shield'. 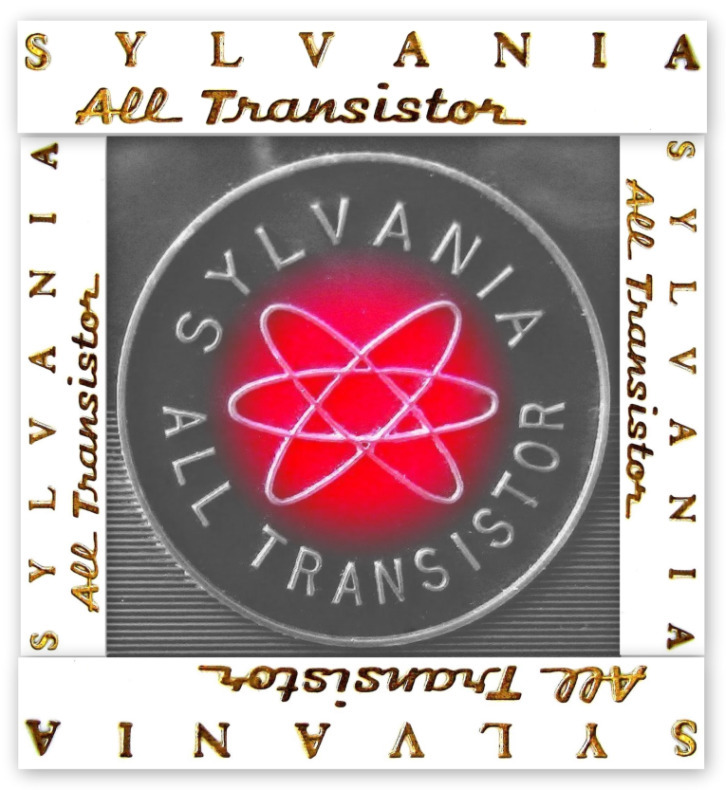 This Sylvania 4P14 is a rather large radio to be using only 4 transistors? It runs on a single 9V battery. The serial number appears to be a very low 67! Collector Alan Kastner of 'RadioWallah' also owns a Sylvania 4P14 and he puts a different spin on my low serial number speculation. The full serial number of his 4P14 is 661100-003-2965. Alan surmises that the top six digits are either a product code number or some similar indication of production lines/runs and that all seven digits that follow likely represent the serial number. Alan suspects this to be the case because the last group of four digits would be insufficient to track the serial numbers needed for the model if Sylvania produced more than 9999. Alan also presents an alternative scenario: The string of three digits in the "middle" could represent the color variation and/or some other aspect of the production run. If so, then the last four digits could show the serial number in relation to that one color or particular. However Alan thinks this is unlikely because such an approach wouldn't require three digits. It would also make the tracking of product overall much more cumbersome and prone to error. And, it would spoil our chances of knowing where the unit stands in terms of its order in overall production.